Have you always dreamed of having the most lavish earrings in the hood but you were too scared to pierce your ears? Piercing your earrings could prove quite traumatizing, especially if you plan on doing it while you are conscious. Many parents decide not to resort to piercing their children’s earlobes because they are afraid of the long-term consequences. Nevertheless, in plenty of cultures, piercing a girl’s ears is done right from the infancy, when the child can only feel temporary pain but is not fully aware of what is happening. However, if you are still scared of needles but still want to look fashionable, jewelry designers have come up with plenty of additional choices, all of which are painless. Some of the most recognized jewelry items are clip-on earrings, that come in countless shapes, sizes, colors, and patterns. But finding the right pair could prove quite a hassle, especially if you are not used to wandering through stores or shopping online. Nevertheless, we are here to help you. Our comprehensive guide contains all the necessary information you need to consider whenever buying a pair of clip-on earrings, no matter your style or wishes. Read below to find the coolest clip-on designs of the moment. If you are looking for a new pair of clip-on earrings to match your outfit or make a statement, you need to take a few things into consideration. Even though you may find clip-on earrings with heavy beadings and rocks extravagant, these may not be the perfect solution. Think twice before purchasing a pair of these clip-on earrings as they can be incredibly heavy and can damage your earlobe. They can cause pains and you will certainly not have a good time wearing them. Moreover, if you are planning on dancing or moving a lot, a pair of heavy earrings will only make you feel uncomfortable. We do suggest opting for more lightweight designs with discreet beadings or stones. These will match all your outfits and will add a touch of glamor even to the dullest evening gowns or dresses. Another great aspect to take into consideration is the materials used for manufacturing the product. We do suggest avoiding cheap alloys which will corrode in time and even cause nasty infections. Make sure the clips are made from soft materials which will caress your ears and won’t cause damage in the longer term. A good choice of materials includes sterling silver, sterling steel, gold, and platinum. However, check for possible allergies to some of these metals before using them. Not only vampires have a sensitivity towards silver, so you may want to check this before buying a pair of clip-on earrings. No matter what you buy, make sure to choose quality over price. A good pair of clip-on earrings can last you a lifetime and even more, turning into really cool vintage pieces of jewelry. On the contrary, if you opt for cheap earrings, chances are you won’t get to enjoy them for more than a couple of uses. Men who don’t want to pierce their ears but still want to adopt a rocker-like attitude can also opt for specially designed earrings for men. They are usually lighter and more discreet than feminine accessories, but will certainly make you look cooler and go well with your rocker attitude or style. Obviously, there is also a wide variety of products designed for men, so no worries about that one. No matter your preferences, we are sure you will find your perfect pair of earrings in no time. Some of the most popular men’s earrings designs include crosses, skulls, and arrows. 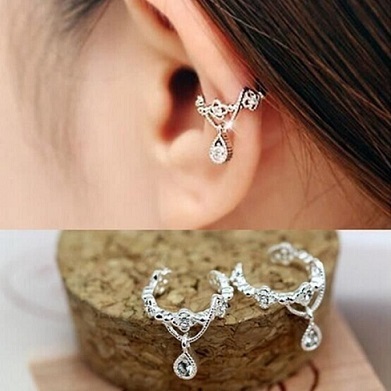 Nevertheless, if you want to be less noticeable but still have a little bling in your ears, you can choose a singular earring with a stone or a pair of small earrings resembling dots. Earrings are one of the oldest pieces of jewelry invented for adorning women’s bodies, ever since the earliest ages. Most of the women back in the day didn’t have their ears pierced, so they also used clip-on earrings. Depending on your personal style and preferences, you can nowadays choose from a wide variety of styles, colors, designs, shapes, and materials. 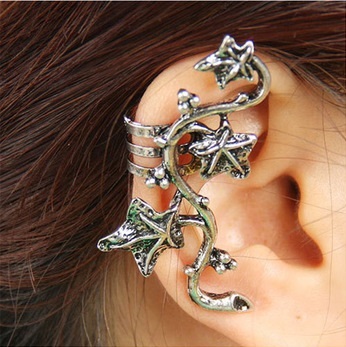 If you truly want to make a statement, you will choose an earcuff rather than a single earring. Earcuffs are made to cover half or the entire ear and also come in a great variety of colors and styles. Some of our favorite ones are inspired by the dragons from a popular TV show or resemble the ancient pieces of jewelry used by warrior princesses. No matter what type of earcuffs you choose, they will bring you empowerment and help you create a unique styling. If you’re more of a romantic type, you cannot go wrong with a pair of classic pearl clip-on earrings. We suggest opting for natural pearls encrusted in platinum or yellow gold for the ultimate touch of classic and elegance. Such a pair could cost you a small fortune, but we are sure you will be keeping it for generations. If you are more into designer work, there are plenty of exclusive brands coming up with their own collection of clip-on earrings. Celebrity designers like Dior or Versace are well-known for their luxuriant jewelry collections. These won’t come cheap either but you can rest assured they will last you for decades as they are made with great care and from the finest materials and have been embellished with natural and precious stones. Last but not least, industrial earrings seem to have made quite the comeback, as more and more brands are reintroducing them in their collections. Industrial earrings contour a tough, tomboy-like style and should be worn with the right attitude. They are usually made from sterling steel or sterling silver and come in rough, edgy, almost unfinished designs. They are the perfect choice to create a rocker-like attitude or for the most rebellious souls.